I have lots of books to recommend, but they are not related to my career path. The only one that is remotely related is Peter Thiel’s Zero to One. That said here are books I would recommend. One of the books that Peter Attia considers to be an important read for people interested in his career path. To err is human. Yet most of us go through life assuming (and sometimes insisting) that we are right about nearly everything, from the origins of the universe to how to load the dishwasher. If being wrong is so natural, why are we all so bad at imagining that our beliefs could be mistaken, and why do we react to our errors with surprise, denial, defensiveness, and shame? In Being Wrong, journalist Kathryn Schulz explores why we find it so gratifying to be right and so maddening to be mistaken, and how this attitude toward error corrodes relationships—whether between family members, colleagues, neighbors, or nations. Along the way, she takes us on a fascinating tour of human fallibility, from wrongful convictions to no-fault divorce; medical mistakes to misadventures at sea; failed prophecies to false memories; "I told you so!" to "Mistakes were made." Drawing on thinkers as varied as Augustine, Darwin, Freud, Gertrude Stein, Alan Greenspan, and Groucho Marx, she proposes a new way of looking at wrongness. In this view, error is both a given and a gift—one that can transform our worldviews, our relationships, and, most profoundly, ourselves. 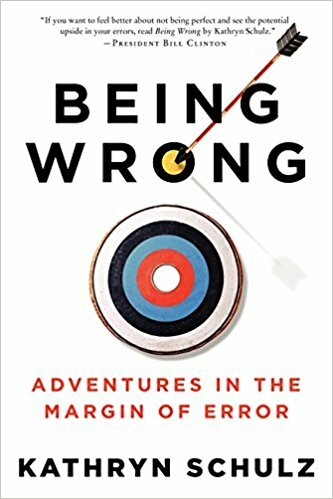 In the end, Being Wrong is not just an account of human error but a tribute to human creativity—the way we generate and revise our beliefs about ourselves and the world. At a moment when economic, political, and religious dogmatism increasingly divide us, Schulz explores with uncommon humor and eloquence the seduction of certainty and the crises occasioned by error. A brilliant debut from a new voice in nonfiction, this book calls on us to ask one of life's most challenging questions: what if I'm wrong?